Purpose: Use this document as a reference for to set up Time Reporting User Preferences in ctcLink. Audience: All faculty and staff required to report time. The preferences specified on this page will be reflected on time reporting pages such as Timesheets and Adjusted Paid Time pages. The TRC Presentation field will default to Show CODE – Description. 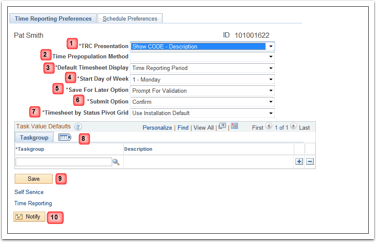 The configuration option determines the order in which the Time Reporting Code is displayed and sorted when viewing the Time Reporting Code field on the timesheet. Use the Time Pre-population Method field to select a value to automatically populate the Timesheet page with default information for reporting time. Options are Task Values, Prior Period, and Schedule information. Use the Default Timesheet Display field to set preferences for Daily, Weekly, or Time ReportingPeriod format. Use the Start Day of Week field to select the default day for the week to start when using the Timesheet page. Save for Later option is not used. The Submit Option field specifies whether the system displays a confirmation page when a time sheet is successfully submitted. Time Sheet by Status Pivot Grid field is not used. Task Group is not used. Click Notify to access the Send Notification page. Use this page with the links provided to email managers, supervisors, or other employees when user preferences are changed. All enterable fields on this page are optional, with the exception of the Telephone/Email option and the Willing to Work fields. Use the Contact Preference section to indicate contact preference for schedule changes. A preferred phone number and email address will appear in this section. Update personal information such as name changes, mailing address, and phone numbers by clicking the Update your contact information link. This information can also be updated using the Self-Service pages. 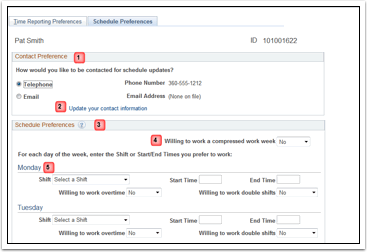 Use the Schedule Preferences section to enter the Shift or Start Time and End Time preferences for each day of the week. Note: This section may be more applicable to assist hourly student employees with identifying a preferred work schedule. Not all fields will apply. The Willing to work a compressed work week field will default to No. The Shift Start Time and End Time fields will populate based on EmplID. If a schedule is assigned, the only shifts available in this field are those shifts that correspond to the schedule ID and the SetID determined by schedule group. If no schedule is assigned, this field will be hidden.